The Day of the Dead is a Mexican custom with Aztec roots, which honours the departed with traditions closely resembling Halloween celebrations to the north. The main function of the holiday is to celebrate the memory of the dead with prayers, parties, and visits to graves. In most regions of Mexico, 1 November honours lost children and infants, whereas 2 November honours dead adults. For this region, the first day is named Dia de los Inocentes, or 'Day of the Innocents'. 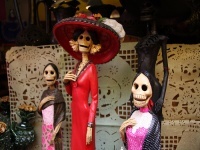 The Mexican celebrations coincide aptly with the Catholic holidays of All Saints' Day and All Souls' Day. In Mexico City, markets and stores liberally stock up with flowers, candy skulls, paper skeletons, and candles. Travellers should note that although the Day of the Dead looks similar to Halloween and does often involve parties and happy celebrations, it is essentially a sombre holiday which has deep meaning for participants and shouldn't be taken lightly by foreigners.